← Can English spelling b impruvd? Are you looking for an activity to do with your child that will promote reading? How about making bookmarks together? Bookmarks are usually long rectangles, about two inches by eight inches. Traditionally they are made from card stock, available at your office supply store. But you can also cut up file folders or those plastic covers of three-ring binders. Notebook or computer paper works well too if you later reinforce it with clear tape or laminating. What kinds of bookmarks can you make? How about these? A small picture of your child with her name and the date in her own handwriting. With a hole punch, put a hole at the top or bottom and attach a ribbon. A drawing your child has made. He could do a large drawing and then cut it apart and paste parts to form a bookmark. Tiny flowers from the garden taped to the bookmark. If they are laminated, they will last for years. A list of words your child can read, or a list of books your child has read. Include the date so the child can appreciate her progress. A drawing of her favorite book character downloaded from the internet. A timeline of the child’s life. The ABC’s in the child’s handwriting with the date, of course. The child’s name in her own handwriting. The child will be thrilled to use her hand-crafted bookmarks when reading her own books, whether she needs the bookmarks or not. Or she can give them as gifts to Mom and Dad, grandparents, teachers and friends. Inside a gift book, a bookmark makes a fine birthday present for another child. Bookmarks can be saved for the future too, when they will become treasured artifacts from the child’s past. 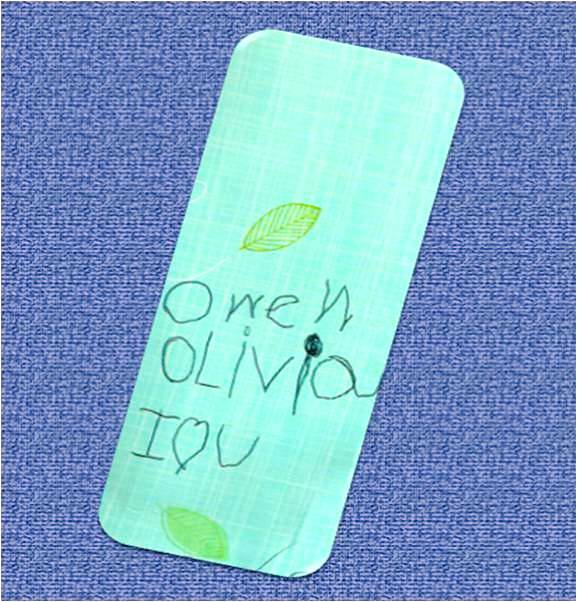 This entry was posted in Handwriting, how to make learning fun and tagged making bookmarks. Bookmark the permalink.